A rich, russet-and-gray bird with bold streaks down its white chest, the Song Sparrow is one of the most familiar North American sparrows. Don't let the bewildering variety of regional differences this bird shows across North America deter you: it's one of the first species you should suspect if you see a streaky sparrow in an open, shrubby, or wet area. If it perches on a low shrub, leans back, and sings a stuttering, clattering song, so much the better. The Song Sparrow is found throughout most of North America, but the birds of different areas can look surprisingly different. Song Sparrows of the Desert Southwest are pale, while those in the Pacific Northwest are dark and heavily streaked. Song Sparrows of Alaska's Aleutian Islands chain are even darker, and they're huge: one-third longer than the eastern birds, and weighing twice as much. 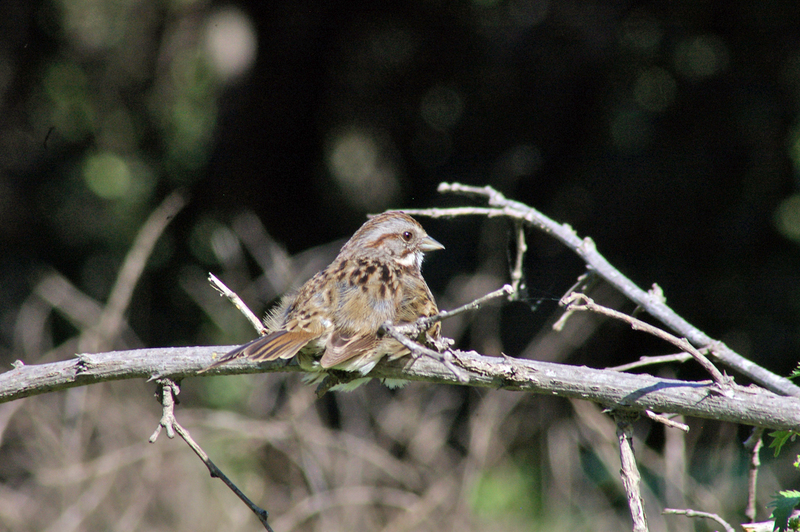 Some scientists think that Song Sparrows of wet, coastal areas have darker plumage as a defense against feather mites and other decay agents that thrive in humid climates. The darker plumage contains more of a pigment called melanin, which makes feathers tougher and harder to degrade than lighter, unpigmented feathers. 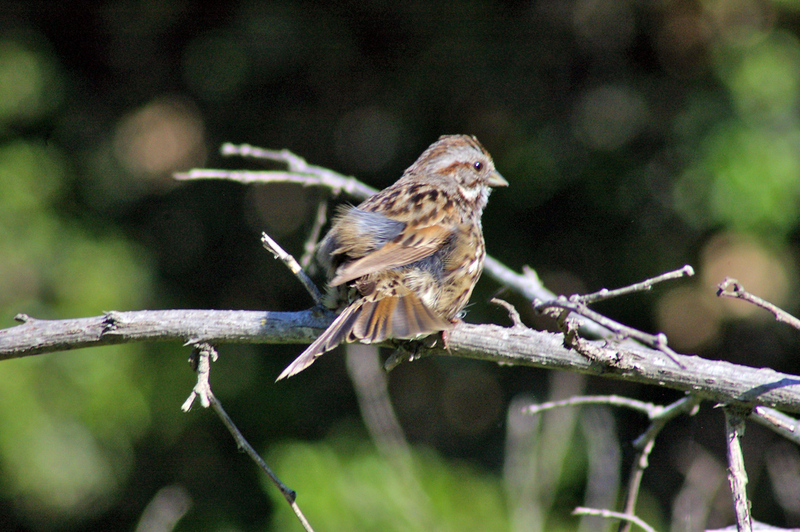 The range of the Song Sparrow is continuous from the Aleutians to the eastern United States. There's also an isolated population that lives on the plateau of central Mexico, about 900 miles from the next closest population. 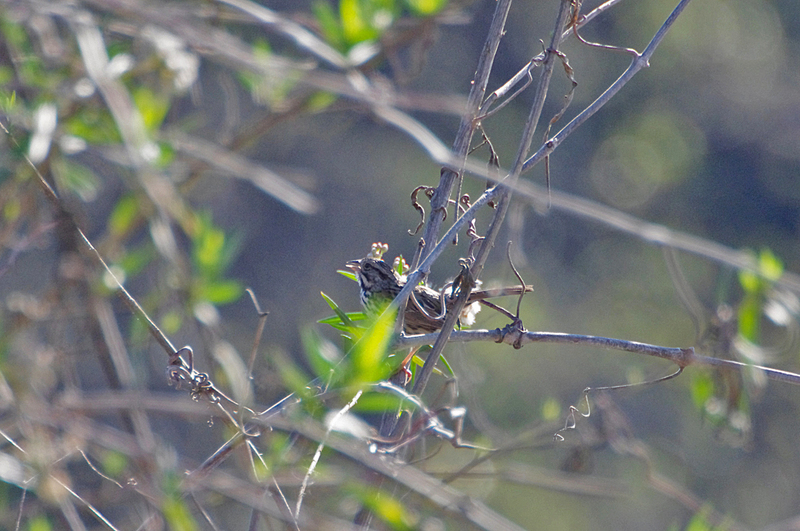 These Song Sparrows have white throats and chests with black streaks. Song Sparrows seem to have a clear idea of what makes a good nest. Field researchers working for many years on the same parcels of land have noticed that some choice spots - the base of a rose bush, or a particular hollow under a hummock of grass, for example - get used over and over again, even when entirely new birds take over the territory. 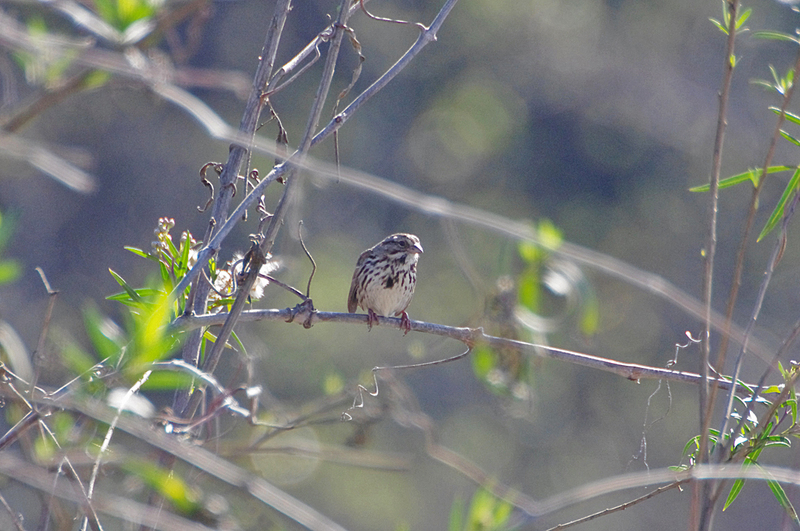 Despite the large differences in size and coloration across the Song Sparrow's range, genetic divergence is low. High rates of immigration and emigration may keep populations genetically similar, while local selective conditions maintain the physical differences. 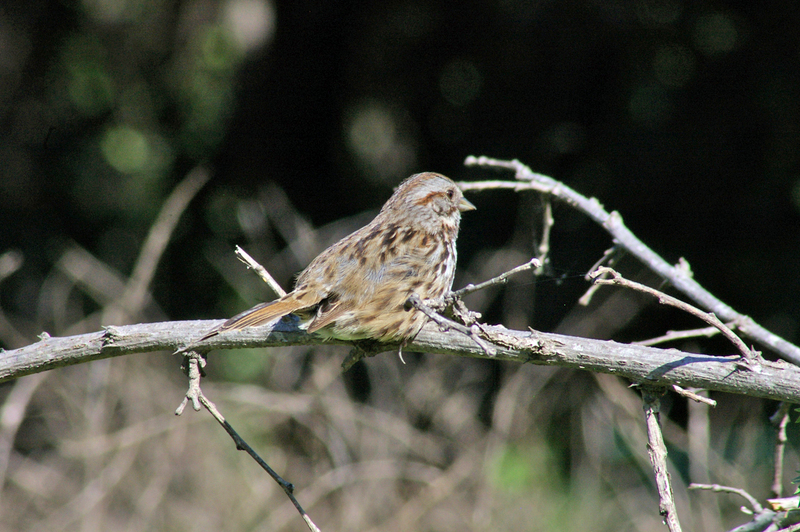 Like many other songbirds, the male Song Sparrow uses its song to attract mates as well as defend its territory. 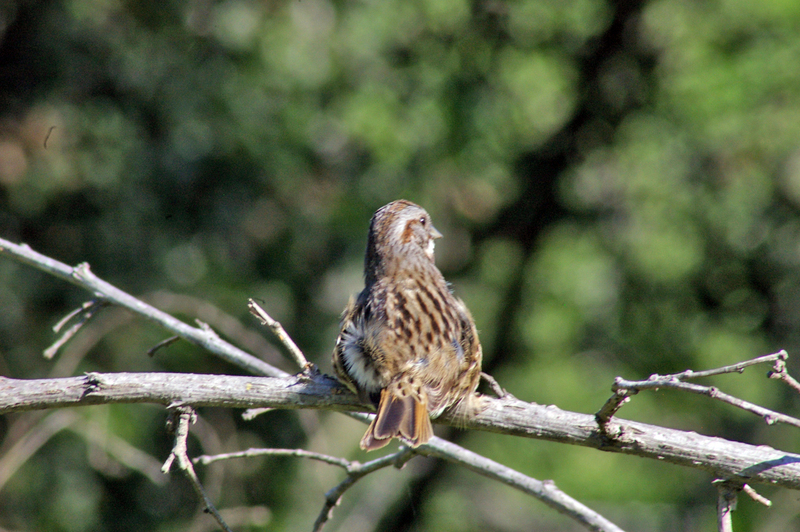 Laboratory studies have shown that the female Song Sparrow is attracted not just to the song itself, but to how well it reflects the ability of the male to learn. Males that used more learned components in their songs and that better matched their song tutors (the adult bird they learned their songs from) were preferred. 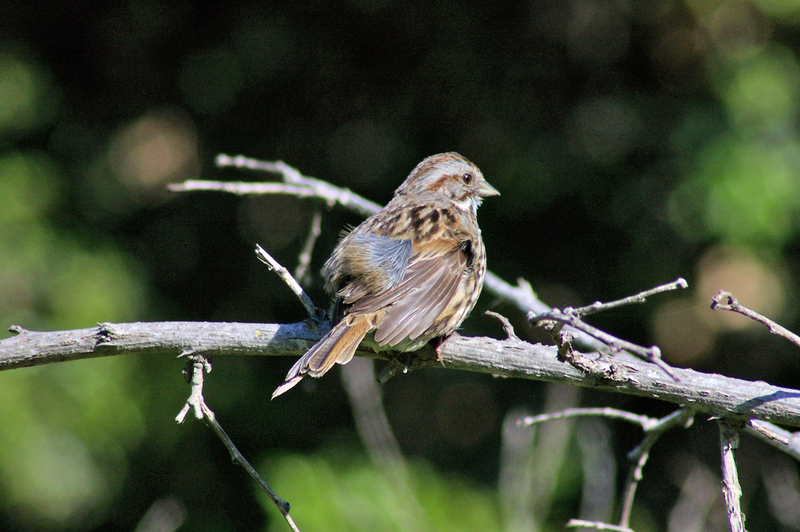 The Song Sparrow, like most other North American breeding birds, uses increasing day length as a cue for when to come into breeding condition. But, other cues can be important too, such as local temperature and food abundance. A study found that male Song Sparrows from the coast of Washington state came into breeding condition two months earlier than Song Sparrows in the nearby mountains, where the daylight changes were the same, but temperatures were cooler and trees budded out two months later. Song Sparrows normally only lay one clutch of eggs per breeding season; however, in exceptional circumstances, such as loss of clutches from predation or an excess of resources, Song Sparrows have been recorded laying as many as seven clutches in a single breeding season and successfully rearing up to four clutches. 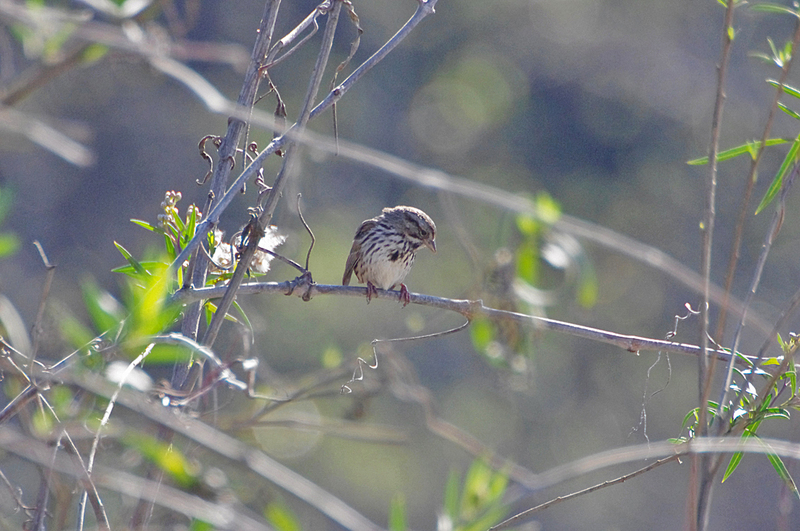 The oldest known Song Sparrow lived to be 11 years, 4 months old. Song Sparrows are medium-sized and fairly bulky sparrows. For a sparrow, the bill is short and stout and the head fairly rounded. The tail is long and rounded, and the wings are broad. 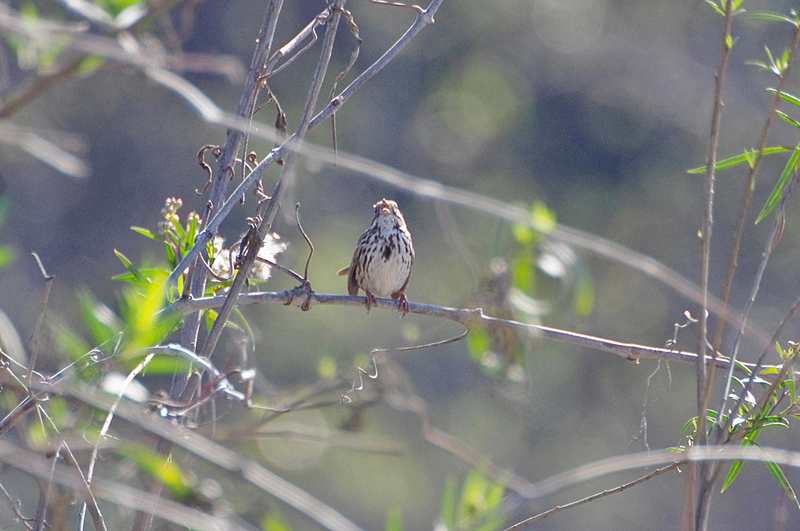 Song Sparrows are streaky and brown with thick streaks on a white chest and flanks. On a closer look, the head is an attractive mix of warm red-brown and slaty gray, though these shades, as well as the amount of streaking, vary extensively across North America. Song Sparrows are found in an enormous variety of open habitats, including tidal marshes, arctic grasslands, desert scrub, pinyon pine forests, aspen parklands, prairie shelterbelts, Pacific rain forest, chaparral, agricultural fields, overgrown pastures, freshwater marsh and lake edges, forest edges, and suburbs. 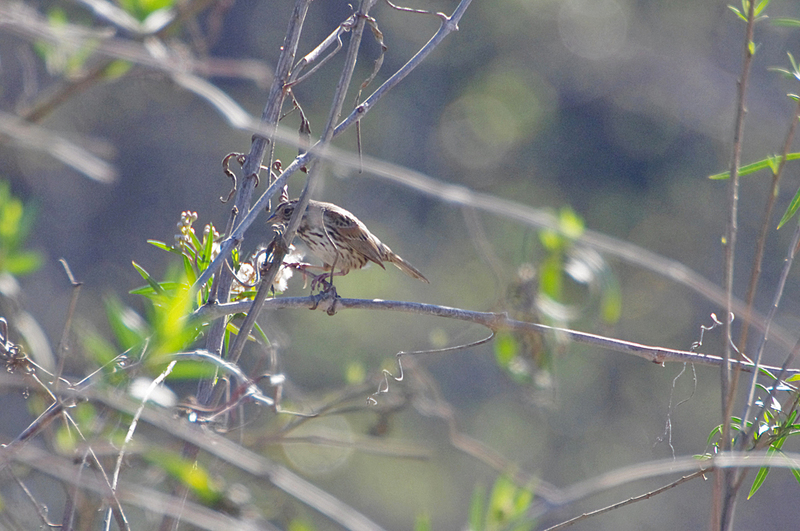 You may also find Song Sparrows in deciduous or mixed woodlands. 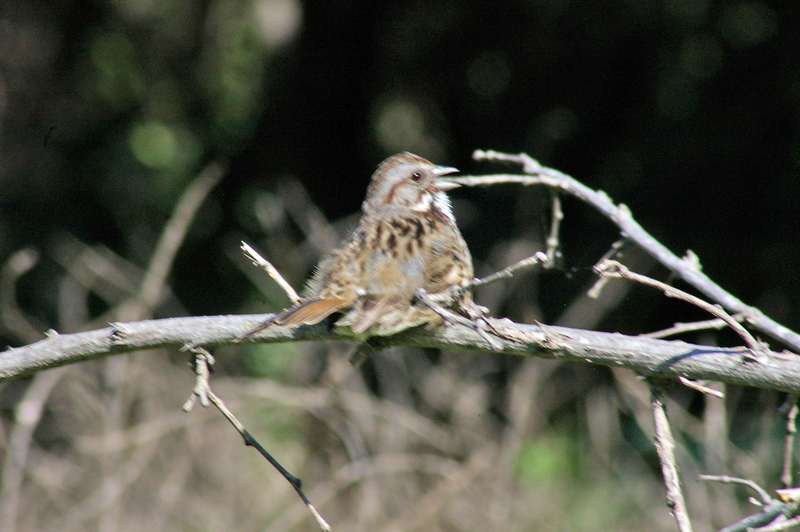 Song Sparrows walk or hop on the ground and flit or hop through branches, grass, and weeds. 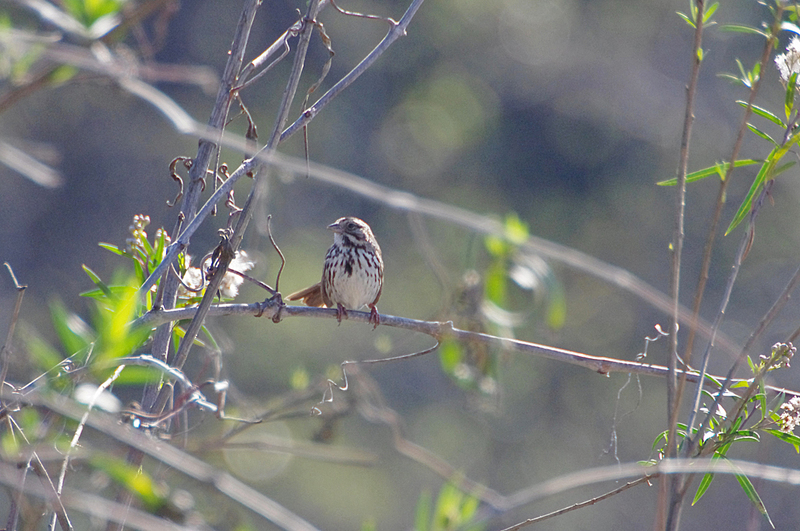 Song Sparrows stay low and forage secretively, but males come to exposed perches, including limbs of small trees, to sing. Courting birds fly together, fluttering their wings, with tails cocked up and legs dangling. Song Sparrows are primarily monogamous, but up to 20 percent of all Song Sparrows sire young with multiple mates each breeding season. 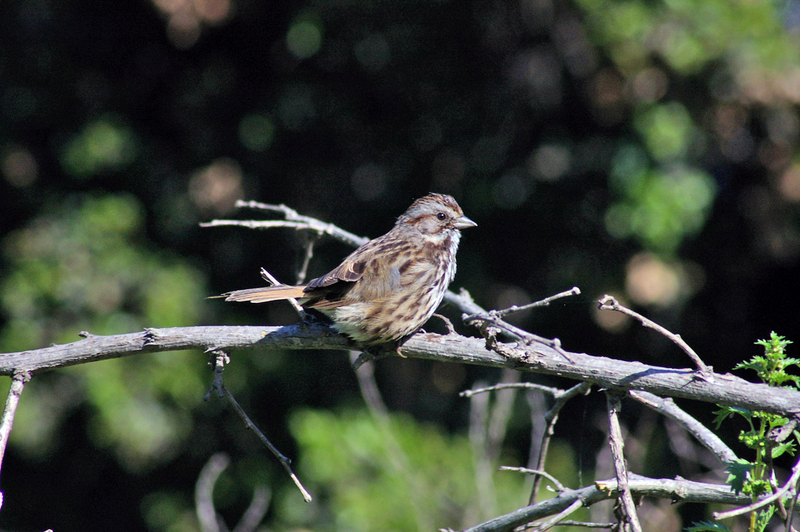 In fall, juvenile Song Sparrows may band together in loose flocks around berry trees or water sources. Flight is direct and low on broad, rounded wings. Often flies only short distances between perches or to cover, characteristically pumping the tail downward as it flies. Song Sparrows eat mainly seeds and fruits, supplemented by many kinds of invertebrates in summer. Prey include weevils, leaf beetles, ground beetles, caterpillars, dragonflies, grasshoppers, midges, craneflies, spiders, snails, and earthworms. Plant foods include buckwheat, ragweed, clover, sunflower, wheat, rice, blackberries, blueberries, strawberries, raspberries, mulberries, and wild cherries. 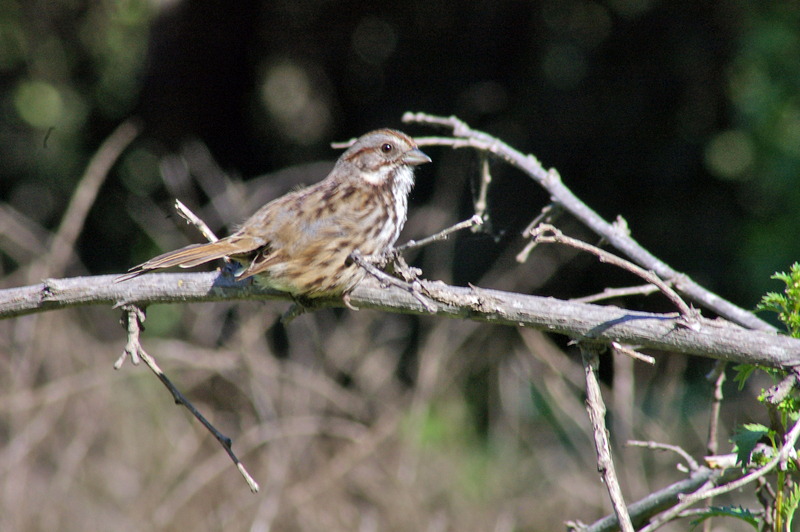 Food types vary greatly depending on what's common across the Song Sparrow's extensive range. 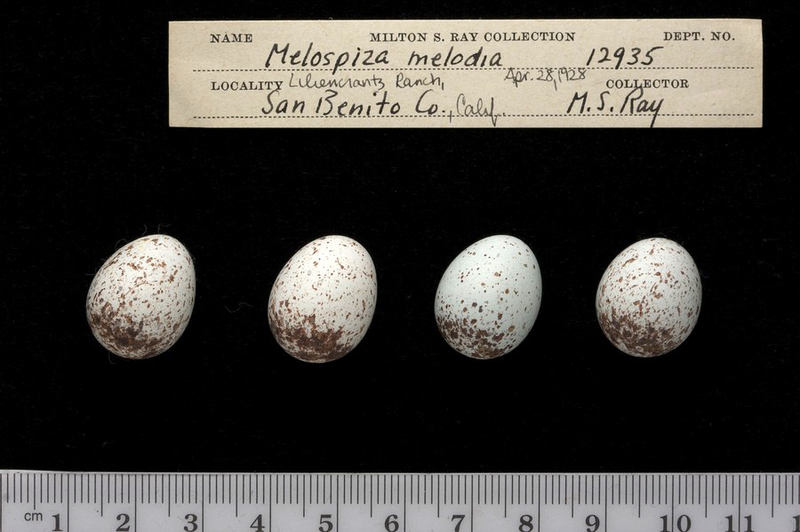 In British Columbia, Song Sparrows have even been observed picking at the droppings of Glaucous-winged Gulls. 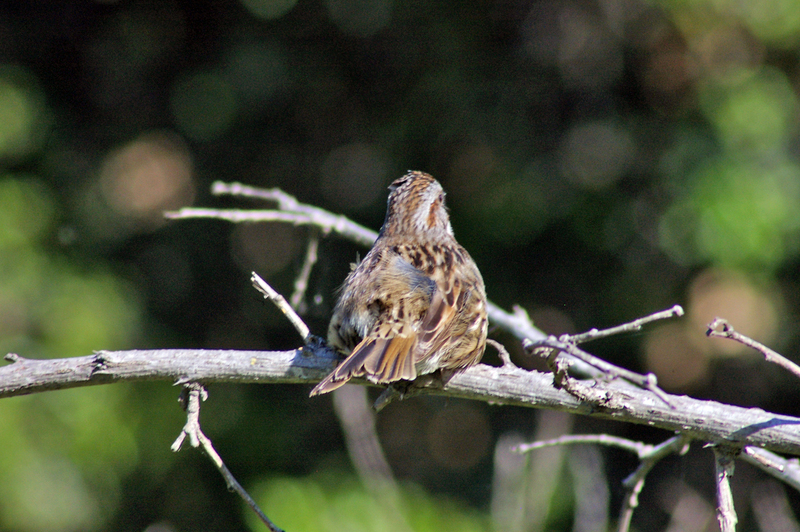 Song Sparrows often have a dark spot in the center of their streaked breast. 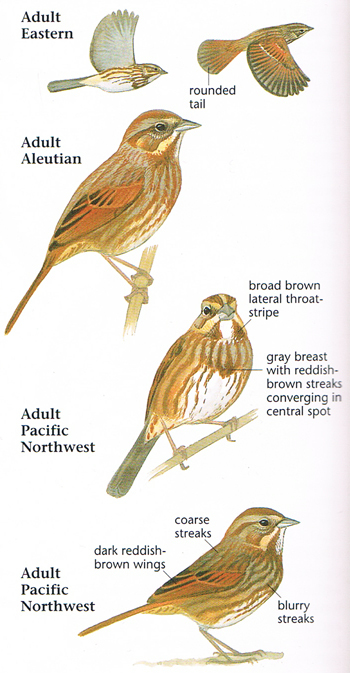 This is a good clue that you may have a Song Sparrow, but other species can show this mark, too - and it can be missing in some Song Sparrows, such as in the Pacific Northwest. To distinguish Song Sparrow from Savannah Sparrow look for the Savannah's yellow tinge between the eyes and bill, the shorter, notched tail, and the typically paler plumage. 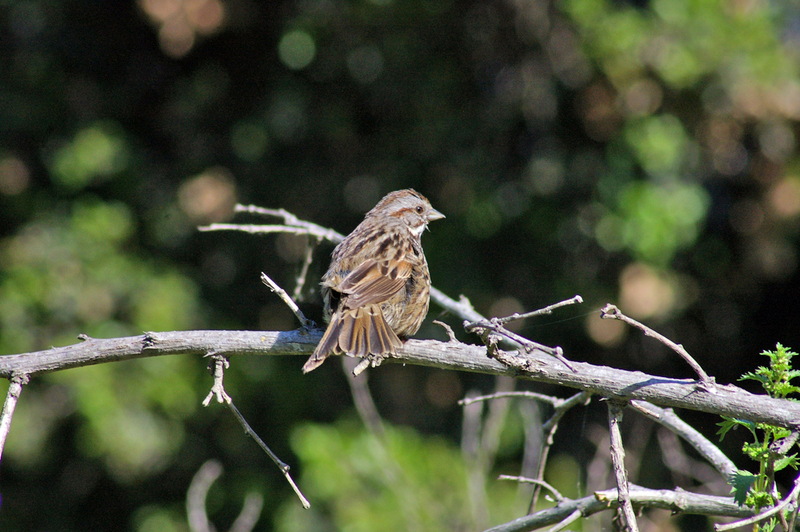 Lincoln's Sparrows have darker gray eyestripes, buff stripes on the sides of the throat, a buffy upper breast, and finer, crisper streaks overall. 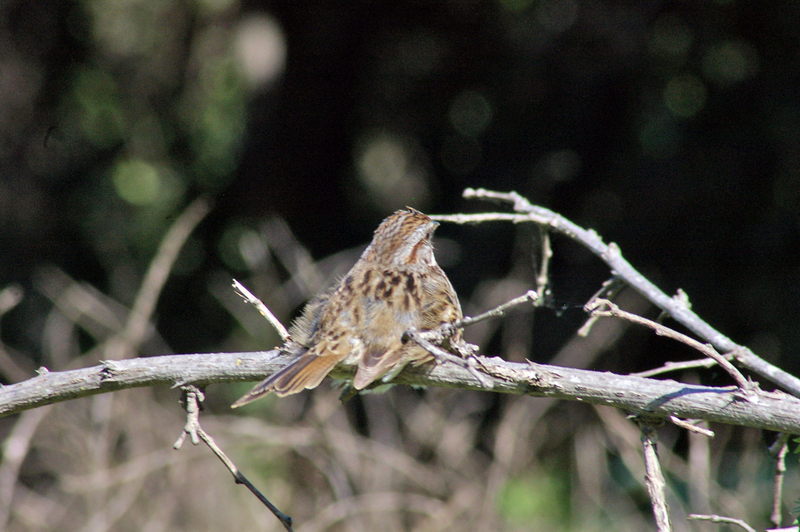 Fox Sparrows are larger and usually redder overall than Song Sparrows. Song Sparrows have a sharp chip note to indicate alarm or anxiety; both sexes make it when excited or if predators approach a nest. Females make a harsh chatter at their mates during nest-building, or at a female intruding on the territory. Young or subordinate birds make a softer, tsip note.